The ‘law’ side of things is not a bounded set of norms, rules, principles, values, or whatever from which jural responses to distilled events can be drawn, but part of a distinctive manner of imagining the real (Geertz 1983: 173). Law is often perceived as part of the bureaucratic rationality of modernity. It is assumed that, in developed societies, legislatures draft laws, police officers enforce them, and courts ensure they are applied fairly. The idea is that law begins and ends with the state. Anthropologists, especially in the field of legal pluralism, have long challenged these assumptions. They demonstrate how social actors have never based their actions solely on state law, but rather selectively to a range of authorities, including elders, religious leaders, even animals or spiritual forces. In our globalizing world, people “imagine the real” by reference to a diversity of international legal principles and national laws, as well as local customs. This is especially visible on the frontlines, when police and conservation officers have to deal with local people who imagine the real in very different ways from state lawmakers. Research in Taiwan illustrates the pluralistic nature of law. Jeffrey Martin (2007) explores how policeman negotiate between law (fa, 法), sentiment (qing, 情), and reason (li, 理) as they are called upon to enforce, for example, laws against restaurants expanding their serving areas well out onto public sidewalks. They experience the quandary of whether law should manage sentiment (“rule of law” – often associated with western modernity), or if sentiment should manage law (“rule of man” – often associated with Chinese tradition). As Martin says, “where law sees sentiment as partiality, sentiment sees law as partiality” (2007: 685). In popular nationalism, Taiwanese are often quite proud that their society is dominated by compassion (renqingwei, 人情味) rather than cold-hearted enforcement of law. Indigenous peoples are acutely aware of potential conflict between customary law and state law, demanding formal state recognition of legal pluralism as a recognition of inherent sovereignty. The Rukai people of Taiwan have local law called Dualixia. Traditional legal values include the sacred nature of nobles and chiefs, the payment of tribute to them for land use, the necessity of hunting for maintaining social relations, and the jungle as a spiritual place where ancestral spirits and oracle birds also have their place in law. These customs have been challenged by private property regimes, intensive agriculture, and state law. 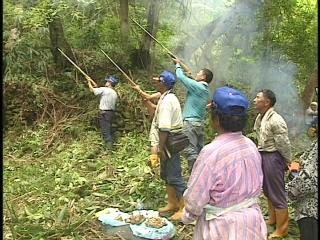 Portnoy and Awi argue that many Taiwanese laws, especially the Forest Law, Wildlife Conservation Law and Indigenous Peoples Basic Law, are based on western ontologies including a nature-society dichotomy (2012: 44). They hope recognition of indigenous legal institutions can promote indigenous autonomy and ecological sustainability. Legal pluralism and the existence of “informal” non-state legal institutions often get overlooked in the promotion of “rule-of-law,” (Janse 2013), not to mention in implementation of international laws regarding, for example, environmental conservation or human rights. Yet, even democratic Taiwan, the paradigmatic Chinese example of rule-of-law, is intimately shaped by an interaction of pluralistic legal values. Indigenous people show that this need not be a source of conflict or obstacle to development. Recognition of legal pluralism can also provide inspiration, and may contribute to a better world for all. Note: The current issue of the Erasmus Law Review is dedicated to legal pluralism, and is available free on-line. Geertz, Clifford. 1983. Local Knowledge: Further Essays in Interpretive Anthropology. New York: Basic Books. Janse, Ronald. 2013. “A Turn to Legal Pluralism in Rule-of-Law Promotion?” Erasmus Law Review 6 (3/4): 181-190. [http://www.erasmuslawreview.nl/files/ELR_2013_03_005.pdf, accessed March 16, 2014]. Martin, Jeffrey. 2007. “A Reasonable Balance of Law and Sentiment: Social Order in Democratic Taiwan from the Policeman’s Point of View.” Law & Society Review 41 (3): 665-697. Portnoy, Caleb and Awi Mona. 2012. “Laws of the Jungle: Conflicts Between International-National Environmental Law and Taromak Rukai-Environment Relations.” Taiwan Journal of Anthropology 10 (1): 21-50.